A few weeks ago I was invited to take a tour through Red Ridge Farms in Dayton, Oregon. I had been there for a wedding, but this time I was able to spend a few hours walking the property, tasting the olive oil, enjoying their wine, shopping their store filled with local products, and savoring the spectacular view of wine country. Throughout the tour I learned how the olive mill started, walked through the pressing facility, and tasted their 4 Extra Virgin Olive Oils: Arbequina, Koroneiki, Tuscan, Frantoio. Each of which has their own distinctive flavor and aroma. Arbequina is one that I use the most in my every day cooking. Whether that be for salad dressings, baking, serving fresh tomato slices with basil. It has a nutty, buttery flavor with a mild pepper finish. Arbequina is also the olive oil that Salt & Straw uses for their Olive Oil ice cream, my personal summer favorite! My favorite part about the tour happened during the tasting. Where we tried these 4 delicious oils and then sampled a cheaper extra virgin olive oil. The less expensive one tasted like pure chemicals. Weeks after the tour, especially while I am shopping, I have been thinking about that experience. Tasting the olive oil that you tend to reach for in the store because it is so much cheaper. Realizing that even though it sometimes is hard to spend the extra few dollars on a certain ingredient, it almost always pays off. And changes the way you feel about food. For this recipe I used to of Oregon Olive Mill's Extra Virgin Olive Oil. Arbequina for the olive oil cake and Koroneiki for the tomato confit. The Koroneiki has a mild arugula flavor and paired perfectly with the tomatoes and herbs. Please note, this is called a Olive Oil Cake, but served in this way, it is completely savory. And honestly one of my most favorite things I have made this summer. 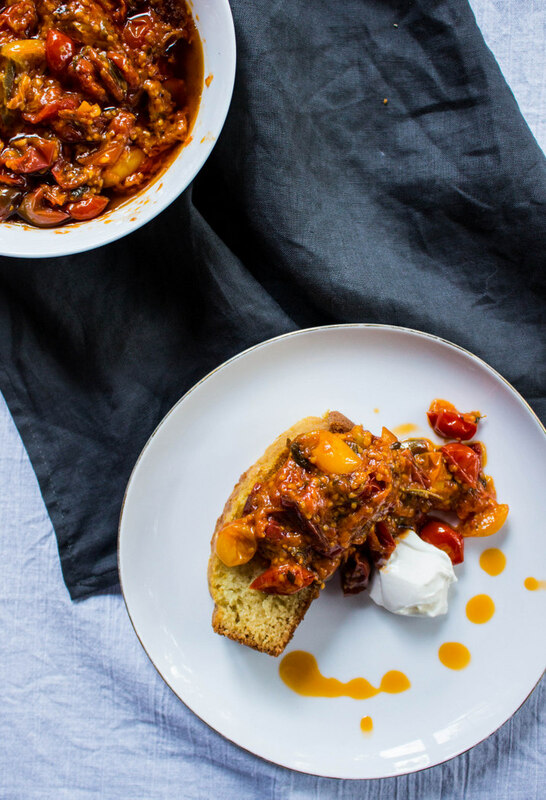 I love it topped with the sweet tomato confit and a big dollop of sour cream. And guess what...Oregon Olive Mill will be at Feast Portland Oregon Bounty Grand Tasting both Friday and Saturday, September 19th + 20th. Tickets are selling fast, go online and buy them now. Let's hang out! In case you missed it, I talked about Double Mountain, one of my favorite breweries being at Feast as well! In a small bowl, beat together eggs, milk and olive oil. Fold wet ingredients into the dry mixture until almost combined. Pour batter into prepared bread pan and bake for 15-20 minutes, until tester comes out clean. In a large skillet over medium high heat, add the tomatoes and olive oil. Stir in the fresh herbs and a very large pinch of kosher salt with a few grinds of black pepper. 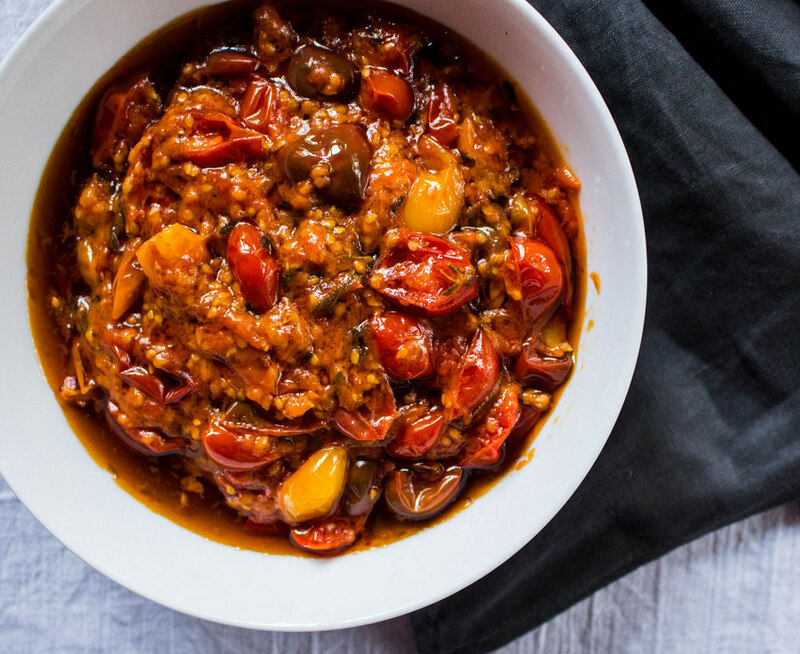 If by chance you have leftover tomato confit, use as pizza sauce, stir into your pasta, or use as sandwich spread. OR my favorite, serve with toasted french baguettes, smeared with goat cheese and topped with the confit. My favorite summer meal.